These Embroidered Purple Ribbon Press & Apply Appliqués have a self-adhesive backing, just peel & stick to apply to clothing, name badges and more. They are ideal for use as an inexpensive fundraiser or can be mailed to contributors. *Available in both 1" and 1-3/8" sizes. *Quantity pricing for both 1" and 1-3/8" sizes. *PLEASE NOTE THAT WE WILL AUTOMATICALLY SHIP THE LARGER RIBBON APPLIQUES UNLESS YOU SPECIFY THAT YOU WANT THE SMALLER APPLIQUES AT THE TIME OF YOUR ORDER. Also available in White Ribbons (Item #139). The White Ribbon Campaign (WRC) is the largest effort in the world of men working to end violence against women. 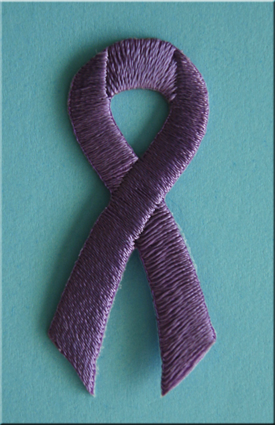 *Also see our PURPLE RIBBON Stickers – Rolls of 1,000 only $53.95 per roll.